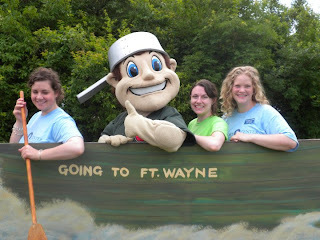 In this era of fanciful and disposable pieces of popular culture, thoroughly void of substance or relevance, the Fort Wayne TinCaps should be given the proverbial ‘tip of the hat’ for a name and mascot so uniquely rooted in Fort Wayne’s past. And yes, one that has some historical accuracy. Of the legions of historical figures who called Fort Wayne and the Three Rivers region their home, perhaps none has been more distorted by lore than John Chapman, aka Johnny Appleseed. The popular image of a thickly bearded, shoddily dressed shoeless fellow crowned with a cast iron cooking pot, whimsically skipping through meadows and aimlessly flinging about apple seeds, belittles and misrepresents this incredibly complex and dynamic individual. In reality he was a shrewd frontier entrepreneur and ultra monastic Swedenborgian missionary who skillfully preceded waves of westerly shifting settlers with his enormous (and enormously profitable) apple tree nurseries. For decades John Chapman purposefully ventured just beyond the flow of westward streaming settlements in Pennsylvania, Ohio, and Indiana, so that as American settlers filled the frontier they would be met with his finely established apple orchards, supplying the fruit for both consumption as a foodstuff, but more importantly for processing into hard cider. John Chapman owned and cultivated numerous land tracts and thousands of acres across these three states, worth a veritable fortune in the early 19th century. Arriving in Fort Wayne around 1830 via a pirogue laden with sacks full of apple seeds, he cared for at least four known apple orchards in Allen County, carefully positioned along the fertile and accessible Maumee River. The largest of John Chapman’s nurseries in Allen County contained over 15,000 apple trees, a gigantic enterprise even by the standards of today’s mechanized agriculture. 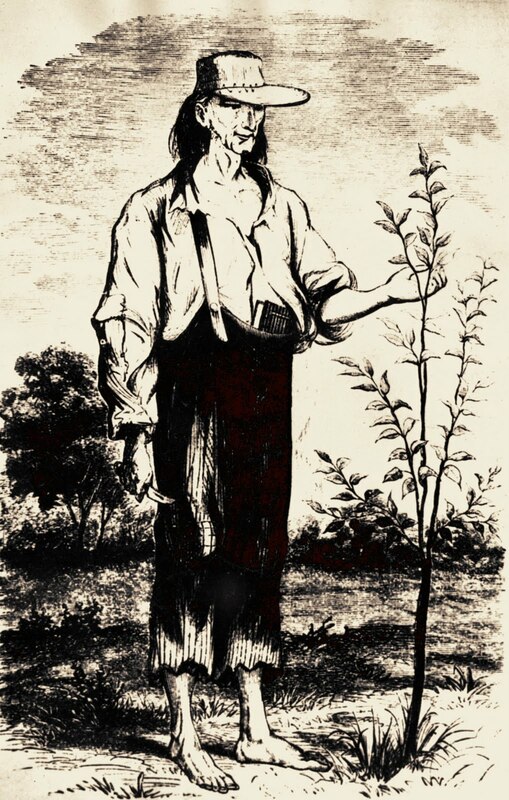 But for all the varying images of Johnny Appleseed as rugged businessman, unkempt beggar, itinerant mystic, or roving planter, one feature of the man transcends all of these descriptions and captivates our community and the world just as it did nearly two centuries ago: his hat. Let this historian go on record as stating that it is a historical fact that occasionally Johnny Appleseed did indeed place a cooking container made of tin on his head. With more than 750 linear feet of archival materials in the historical collection of the History Center (to put that in perspective, if one stacked the Lincoln Tower on top of One Summit Square the total height would be just about as tall as the stack of papers from our archives) there are two-only two-eyewitness accounts of Johnny Appleseed wearing a tin cap. 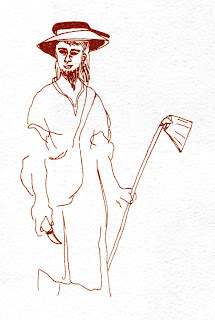 The first account is from John Dawson, a local newspaper editor and contemporary of Johnny Appleseed, observing that “his headgear was rarely ever alike for a long time.” More than once, Dawson saw Johnny Appleseed with “a tin vessel worn on his head, which he used to cook his frugal meals in.” Dawson goes on to note that sometimes Johnny Appleseed would wear multiple layers of hats where “he carried his Testament and Swedenborgian books,” placing his cooking pot atop the amalgamation. The second account comes to us from the Johnny Appleseed Educational Center and Museum at Urbana University, Ohio. 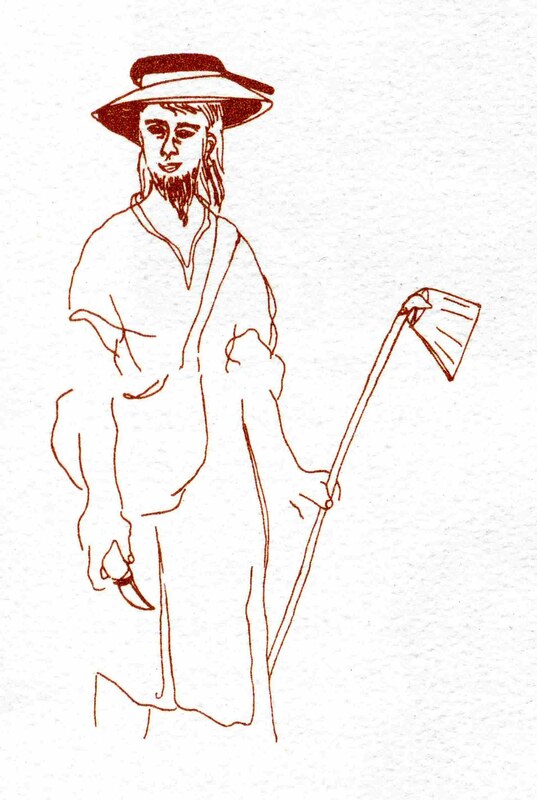 John Henry Cook of Ohio similarly observed Johnny Appleseed’s “pyramid of three hats, [which] enabled him to carry not only his kettle but his treasurers of sacred literature.” Known to be a devout adherer to the Church of New Jerusalem (Swedenborgianism), Johnny Appleseed’s only true worldly possessions were his Bible and Swedenborgian tracts, which he kept dry and safe on his head beneath his waterproof tin cap. Without a printing press for hundreds of miles, preserving his religious papers and books for distribution to settlers was essential in allowing him to deliver “news right fresh from Heaven,” as he fondly described his preaching. The memory and contemporary interpretations of John Chapman provide both a fascinating case study in the analysis and assessment of historical sources, and a good lesson in the role that the past plays in our everyday, (and I hate to say it) popular history. As our community wished the TinCaps another fruitful season with the new name, mascot, and home, many children and adults alike undoubtedly asked “did he really wear a tin cap.” Did Johnny Appleseed wear a tin cap…certainly. Did he wear a tin cap all the time…absolutely not. But what matters is that in a time when spin is the norm and context goes out the window, fans of the newly rechristened TinCaps are exposed to a small glimmer of truthful history. Good history is hard to find nowadays; folks should take it any way they can.